composite breast augmentation - Excellence in plastic surgery. Auclair E, Blondeel P, Del Vecchio DA. Composite Breast Augmentation: Soft-Tissue Planning Using Implants and Fat. Plast Reconstr Surg. 2013 Sep;132(3):558-68. The standard in breast augmentation used to be placement of a silicone implant behind the big pectoral muscle. This was done to cover the upper edge of the implant in order to create a more natural décolleté area. 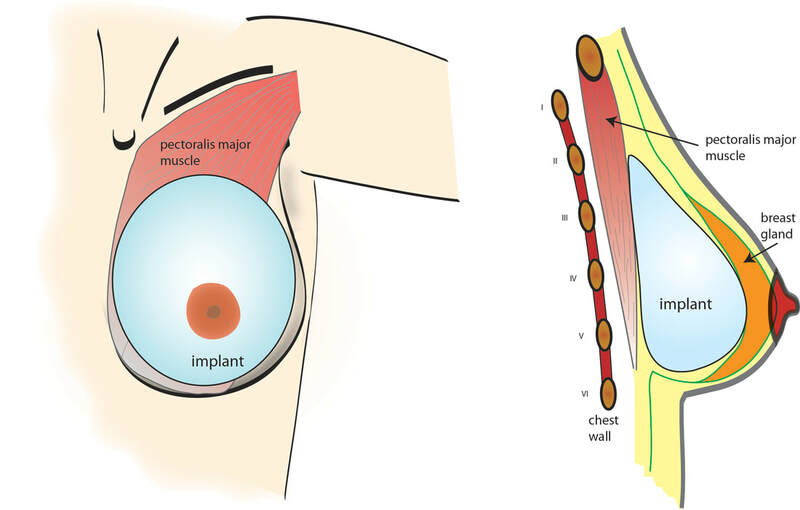 To avoid the problems of pain and implant animation, the silicone implant can be placed in front of the pectoral muscle. This technique works however only in patients that have sufficient thickness of their subcutaneous fat layer. This layer will camouflage the (upper) borders of the implant, ensuring a natural-looking result. the breast skin needs a certain laxity: this occurs mostly after pregnancy or weight changes. To create natural looking breast augmentations that avoid the disadvantages of the other techniques, mentioned above we have been performing Composite Breast Augmentations (CBA) since 2010. 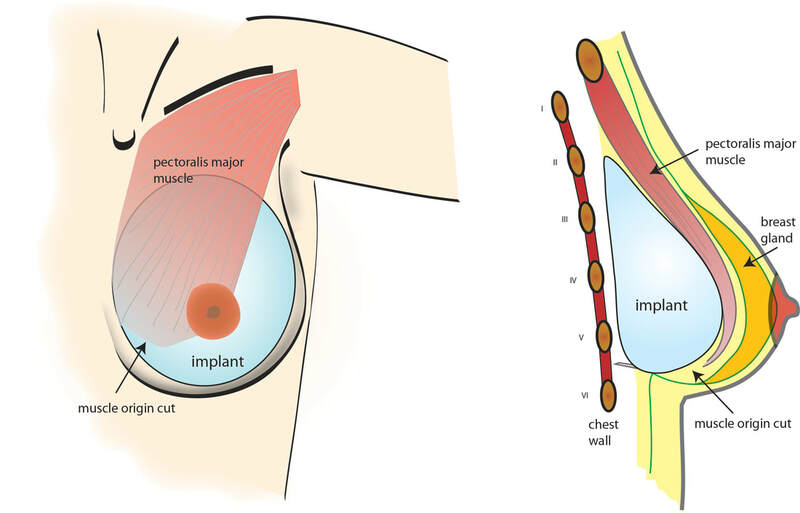 The implant is placed in front of the pectoral muscle mostly through a incision at the inframammary crease. This type of incision will allow easy revision if necessary in a later phase. It also allows perfect control of the creation of the pocket in which the implant is positioned. Lipofilling is performed in the deeper layers just above the implant and in a superficial plane at the level of the medial and upper border of the implant, hereby camouflaging the implant border and providing a natural-looking décolleté. Lipofilling can also be performed over the entire breast in the subcutaneous layer. This will create an even more natural result. Sufficient fat needs to be available for this variant. This will also will allow the use of even smaller implants, favouring the balance of patient's own tissues over implant volume. This will provide better long-term results. The main disadvantage of this technique is that it has a prolonged operating time, what means that the procedure is often more expensive than other conventional breast augmentation techniques. On the other hand, it is a two-in-one operative procedure combining breast augmentation with body contouring.